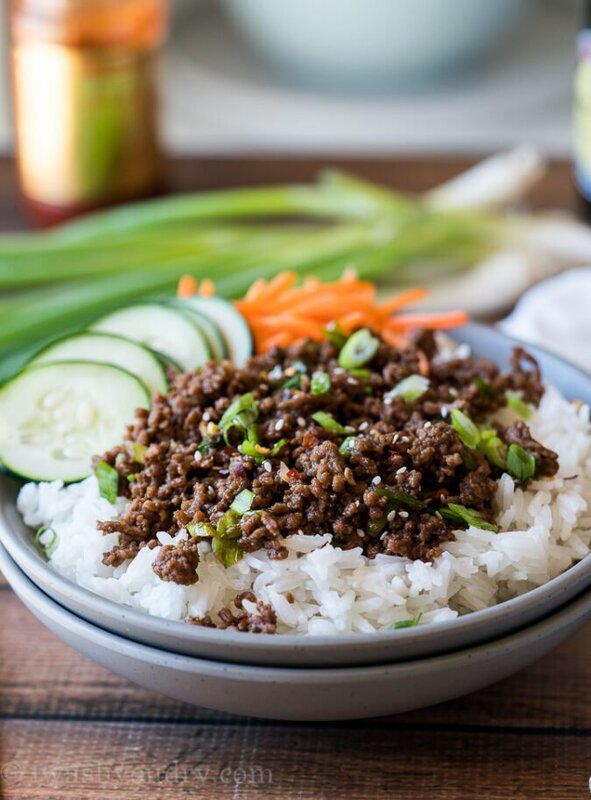 This super easy Korean Ground Beef Recipe comes together in less than 15 minutes and is bursting with sweet and spicy flavor. If you’re looking for an easy recipe to serve your family that uses that last bit of ground beef in your fridge or freezer, than this is it! 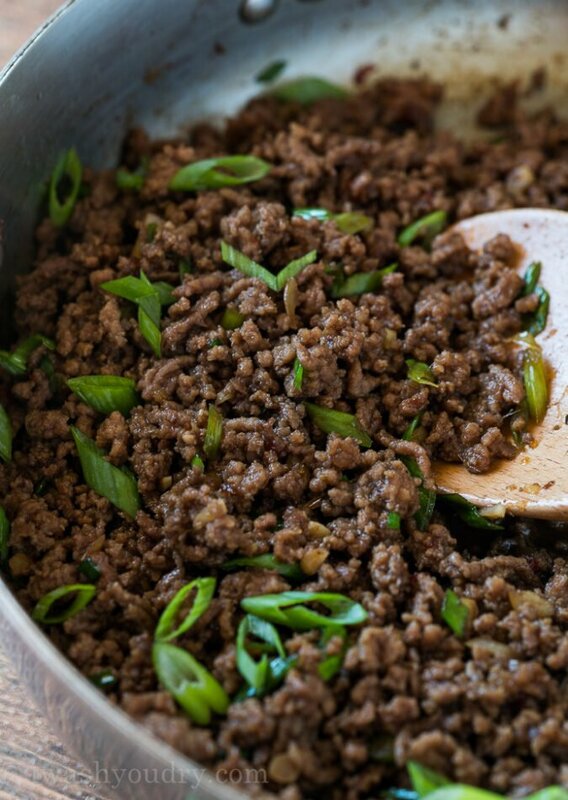 Start by browning your lean ground beef in a skillet with garlic and ginger. Drain any excess fat and then return to the stove top. Season with a little sesame oil, brown sugar, soy sauce and chili garlic sauce (or Sriracha if desired). 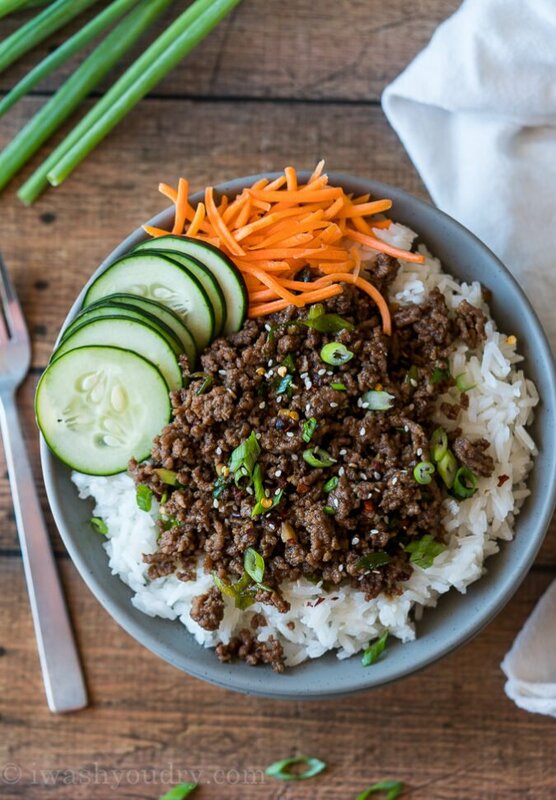 We love to serve this deliciously seasoned ground beef right on top of a bed of hot rice. To make it a full meal – I’ll add sliced cucumbers and matchstick carrots alongside the ground beef and rice. How Can I Make this Ground Beef Recipe Low Carb? 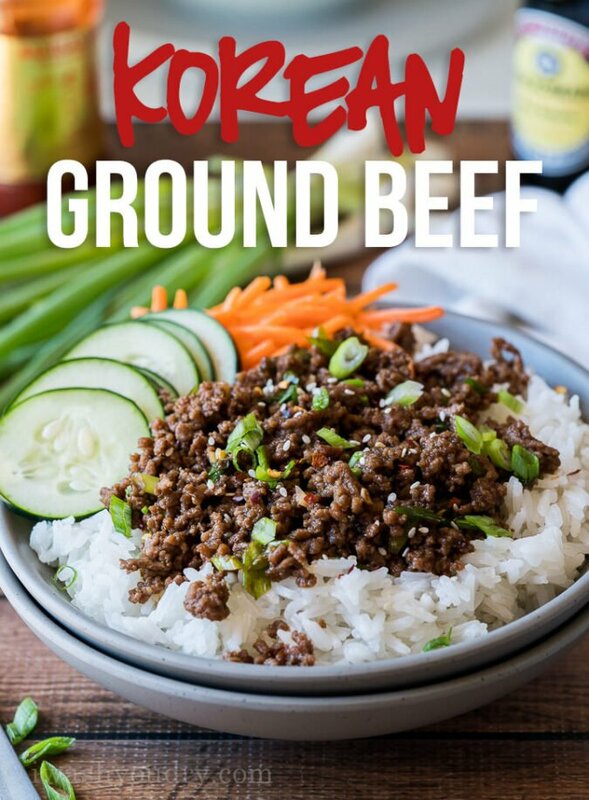 Believe it or not, this Korean Ground Beef Recipe can easily be converted to a low carb meal! Swap out the brown sugar for a low carb brown sugar sweetener. Serve the ground beef over a bed of hot cauliflower rice instead of regular rice. Try serving the Korean Ground Beef mixture in a lettuce wrap for a fun taco-inspired dish! 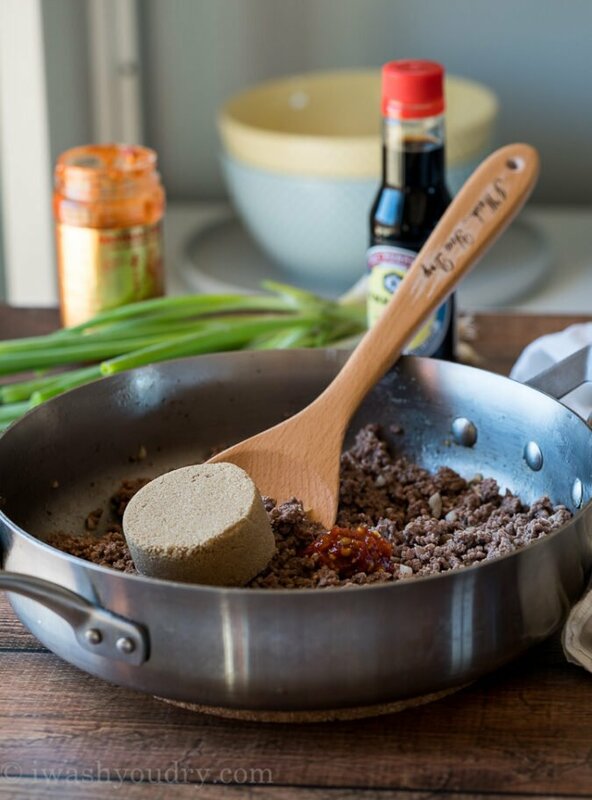 This super easy ground beef recipe comes together in less than 15 minutes with ingredients that you probably already have on hand. In fact, I have to start cooking the rice before I even start browning the beef because it cooks that fast! If you’re using minute rice, you’ll be sitting down to eat dinner even quicker! Try pairing this easy dish with a side of Egg Drop Soup or these Crispy Chicken Egg Rolls. My kids went nuts for this super quick dinner recipe. It was perfect for our busy weeknight when I had to run two kids to gymnastics, one to mountain bike practice and help the other with a school project. I’m sure you’re going to love how quickly and easily this dinner comes together for you as well! 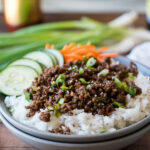 This super easy Korean Ground Beef Recipe is a slightly sweet and spicy beef mixture that’s served on top of a bed of hot rice. Brown the ground beef, garlic and ginger in a skillet over medium heat, breaking the ground beef into small pieces until no longer pink. Drain any excess fat and return skillet to stove top. Add in the sesame oil, brown sugar, soy sauce and chili garlic sauce and bring to a simmer, stirring until the meat is moistened and the glossy. Add in half of the green onions and cook until fragrant, about 1 minute. Serve the ground beef mixture on top of the hot rice along side the cucumbers and carrots. Garnish with additional green onions and sesame seeds if desired. Enjoy! Feel free to substitute ground turkey for ground beef if desired. Could you use chicken instead of the ground beef? 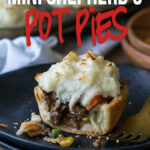 I have made this with the ground beef and its delicious!! You could definitely use ground chicken, but if you used chicken breast you would want to dice it up first. Not sure how the flavor would be using chicken. Let me know how it turns out if you try it. This was super easy! 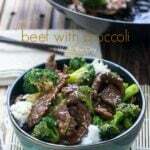 I’ve been wanting to try my hand at more Asian recipes and this was a great and easy one to start with! Excited to make again! Yummy! Super easy to make. OK! Shawn! This was so easy, quick and amazing! 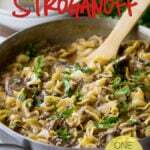 Definitly a go to fast meal on short time and taste like alot of work. I did bump up the chili-garlic sauce, cause liked more heat, and added lots of cilantro and a splash of fish sauce as previously suggested. Great job!! I put a little fish oil in mine! Not too much just a little! Makes it so good! Oh that sounds great! I’ll have to try that next time too! There are so many different sesame oils. Which one do you use? Clear or toasted or Plain? I have used plain sesame oil and toasted sesame oil for this recipe, both work great!